Many of you already know about Michael Vick, the Atlanta Falcons quarterback who’s been accused of running a dog-fighting operation out of his Bad Newz Kennels (I guess he can throw a football but he can’t spell.) Here’s a dude making a gazillion dollars playing football and the knucklehead thinks he’s a big bad thug in the ‘hood. And if the dog-fighting isn’t bad enough, he’s charged with other counts of animal abuse because he killed the dogs that did not perform to his standards by hanging, beating, or electrocuting them. These are the sports role models that kids have to look up to today. Athletes like Walter Payton are probably rolling in their graves. 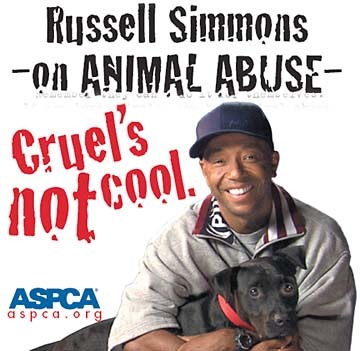 By the way, the above picture is NOT Michael Vick — Russell Simmons is a hip-hop record producer AND a yogi. Yeah, yeah, I know that everyone is “innocent” until proven guilty, but as Vanessa writes about Michael Vick here and here, Vick’s co-defendant is singing like a canary and unless the ghost of Johnny Cochran appears, Vick is history just like his dogs. As a Buddhist I believe in karma, cause and effect, what goes around comes around. And I’m thinking that when Vick goes to that football stadium in the sky, he’s coming back as a pit bull or one of the small animals like a cat or rabbit — sometimes stolen, but also procured from those “free to a good home” ads — that those oh so macho guys throw in the ring to give their dogs a taste of blood. There is a special place in the hell realms for Vick and others like him. As much as Michael Vick’s actions sicken me, I also feel sorry for him, believe it or not. I am an animal lover to the core, and Gandhi said that “the greatness of a nation and its moral progress can be judged by the way its animals are treated.” When I hear about animal abuse or child abuse or abuse of any kind, I wonder what was so lacking in someone’s life that they have no hesitation whatsoever to inflict such suffering on another living thing. I wonder how someone can be so completely shut down that they don’t even realize what they are doing, especially ultimately to themselves. I want Vick prosecuted to the fullest extent of the law, but man, what is it that makes him think that there is nothing wrong in what he did? What is in the deepest recess of his soul that takes pleasure in watching dogs tear each other apart and then think nothing of hanging the loser? I read that Vick was the “big money man” at the dog fights and would bet thousands of dollars on his dogs…so was it greed? Buddha said that all the misery in the world is caused by three things: attachment, aversion, and ignorance. Many people suffer at the hands of their abusers but do not become abusers themselves. Many people grow up amidst violence but somehow rise above it to have peaceful hearts. Why is it one way for some and not for others? Karma…and choices. During a dharma reading to my yoga class this morning, I thought about Michael Vick. The Buddhist writer wrote that if we look beneath the surface deeply enough, we begin to realize that everyone wants the same thing: that everyone, no matter who they are, wishes for happiness and freedom from suffering. I’ve heard the Dalai Lama say that true compassion is seeing everyone as ourselves and seeing ourselves in other people. I believe that every human heart is capable of the Four Immeasurables — love, compassion, joy, and equanimity — sigh…even people like Michael Vick. If I did not believe it, I would not be a Buddhist. Maybe Michael Vick should be sentenced to do some community service with Little Lotus Hearts. Little Lotus Hearts provides services to people who have a deep love and respect for animals. As Tibetan Buddhist practitioners, the founders believe in the Buddhist teaching that all sentient beings are equal, in that they all wish for happiness and the avoidance of suffering. Might be a good place for him to start practicing compassion and ahimsa. Once he gets out of jail.